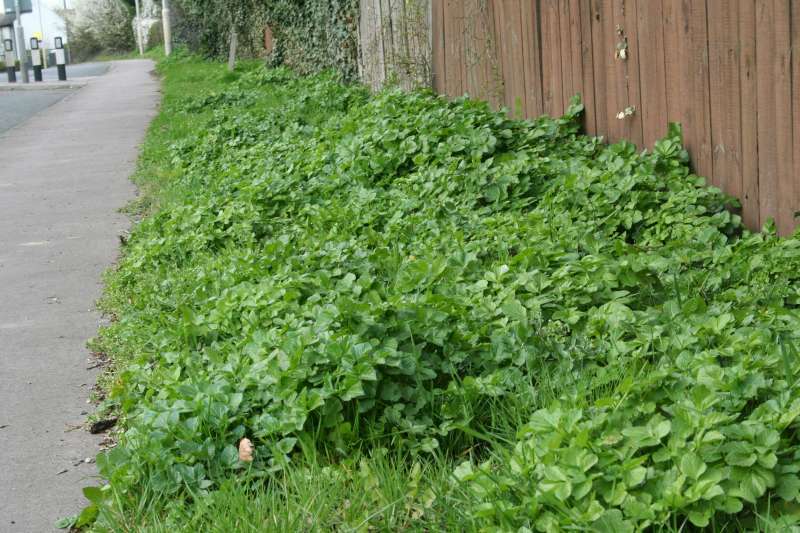 Originally a maritime plant, it seems to be spreading inland along roadsides. I assume that is because the seeds get trapped in the tread of car tyres and thereby distributed. 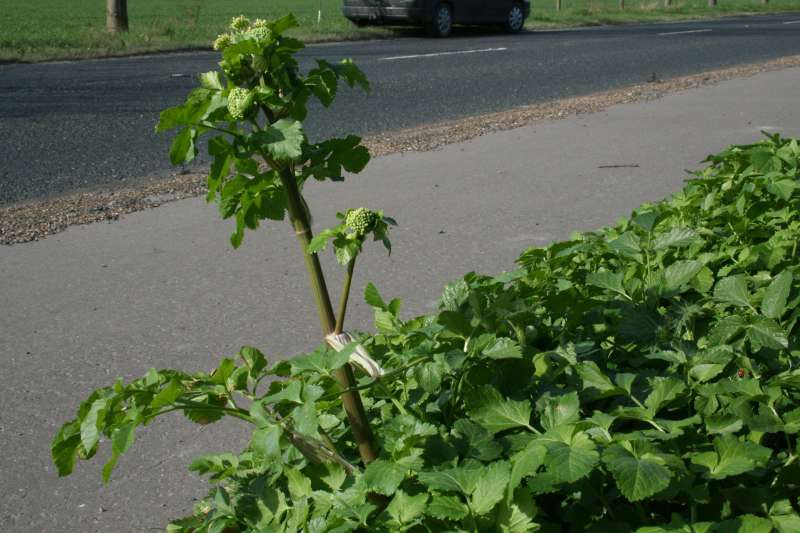 The first four pictures below were taken by roadsides around Cambridge where Alexanders is quite common. Above: the road in Fordham, 24th March 2009. 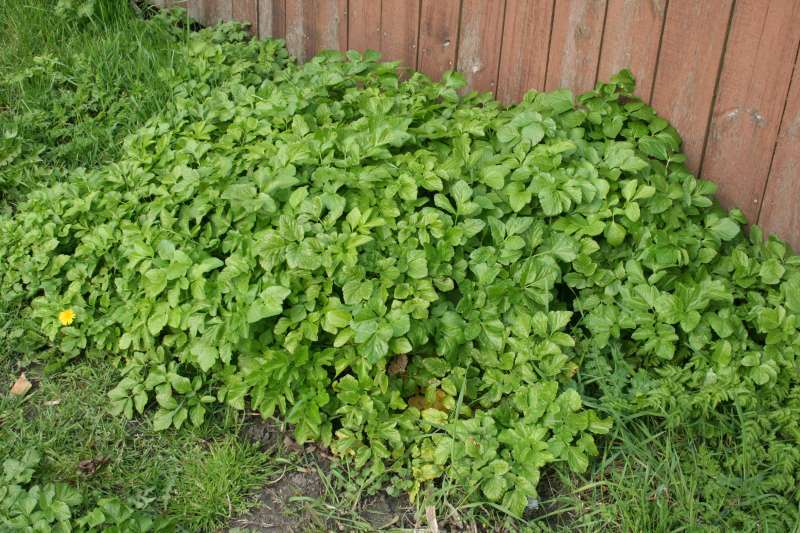 At this stage the young leaves are a tasty addition to salads. However the taste is very strong and not to everybody's liking, so add in moderation. These photos were taken on the roadside between Fulbourn and Cherry Hinton near Cambridge, taken 5th April 2009. 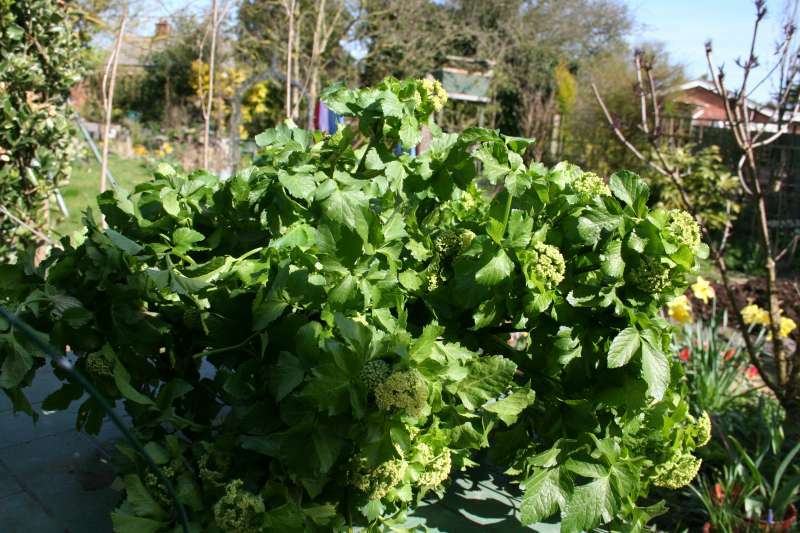 This is the ideal time to use Alexanders as a very tasty vegetable. The pictures below show it being prepared. 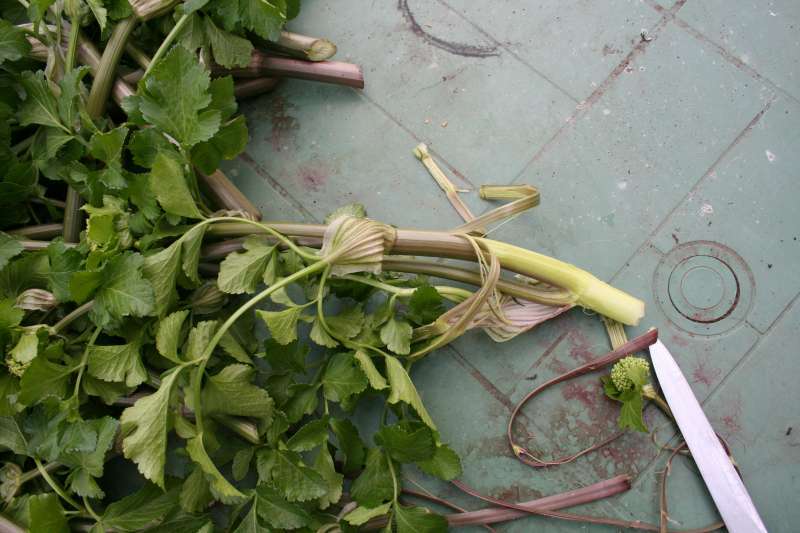 To prepare Alexanders stems, pick the flowering peduncles before the flowers start to open but while the flowers are definitely in bud. The young peduncle will snap off quite easily at th correct length. Picture 1 shows such a crop ready for preparation. 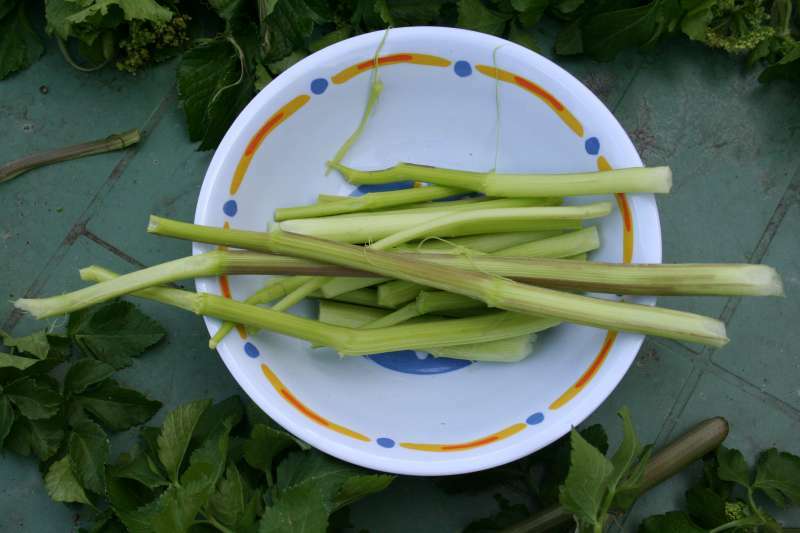 The stems peel quite easily as shown on picture 2. The outside is quite stringy and very strong tasting.The pith inside at this stage is succulent and delicately flavoured. The third picture shows peeling in process: unpeeled peduncled on the left and peeled stems in the middle. There is quite a lot of waste material, shown right. 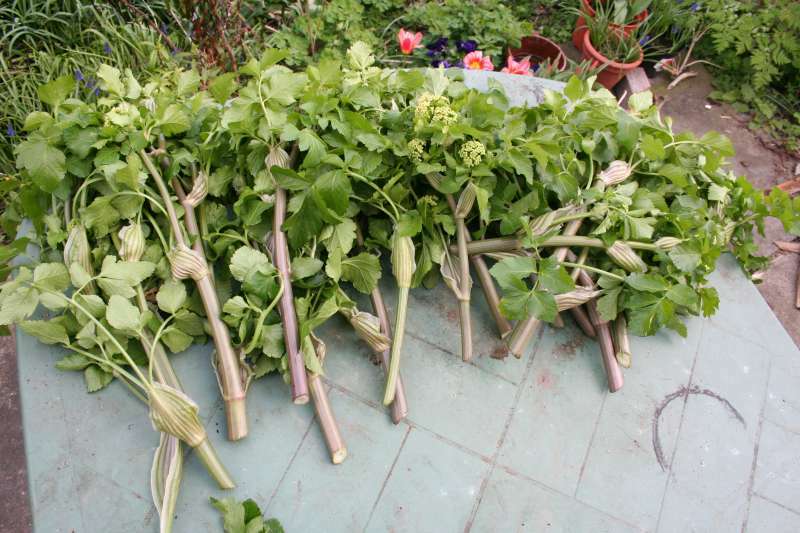 Picture 4 shows a bowl of peeled stems ready for cooking. The flavour of this dish is quite distinctive. Aromatic, almost perfumed. Probably not to everyone's taste, even thus prepared, but definitely worth trying. 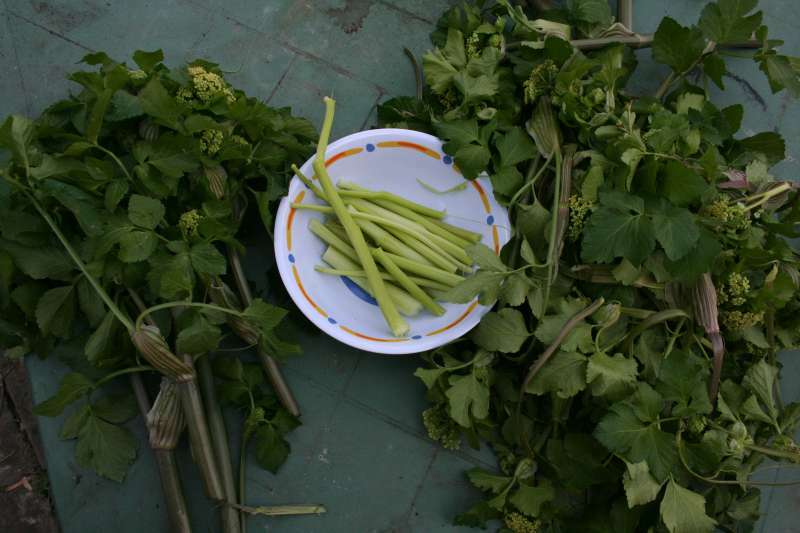 Alexanders tend to grow in dense patches so it's usually easy to harvest an adequate supply. Page first published Friday the 12th of June, 2009.